Amongst the 18 spp which I found in NBGW this week were a couple of Russula - all too slug damaged to identify. However I've just come across another Russula in the wood which was in near perfect condition. Funga Nordica lists over 150 spp of Russula, most of which are in Geoffrey Kibby's "Key to the Genus Russula" - which is what I used to key these out. Although R. subfoetens has a number of distinguishing features, none of them are instantly obvious. The cap reacts to KOH and the gills are hot and acrid (I really wish he didn't make me taste them!!! ), the stem is cavernous and turns brown when exposed to the air. Normally, looking at the shape and size of the spores is enough, however in this case it required measuring the size of the warts growing on the surface of the spores and the extent of the connective tissue between them. It's a bit like trying to count how many angels are dancing on the head of a pin, and oh, by the way could you please tell me the steps they are doing! 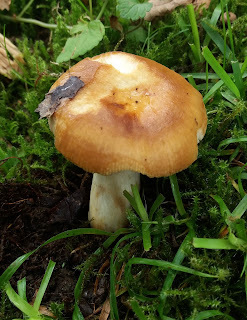 A little while ago I found another Russula growing in the wood which enjoys the lovely name - The Greasy Green Brittlegill. If only greasy and green were all it took to identify it! You are brave. I gave up on Russula ID long ago ---- I stick to the most obvious ones with clear macroscopic features. Keep up the good work! You measured the size of the warts on the spores!!! I admire your dedication Tony.